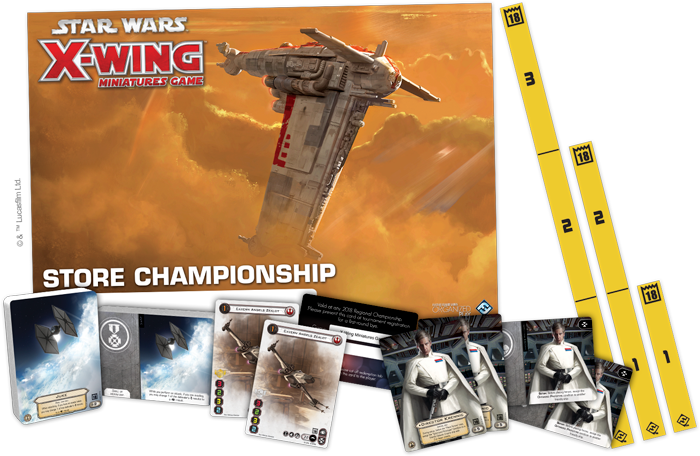 Join the high-stakes dogfights of the Galactic Civil War with the 2018 X-Wing Store Championship! First place will receive a bye at a regional tournament, and there are plenty of other prizes to go around. We will play Swiss rounds based on attendance, followed by a cut to the top 4 or 8 as appropriate. This is a competitive event, which means players should have a strong grasp of the rules of the game but need not be experts. Top 8: Each player receives one set of range rulers (ranges 1-3). Top 4: Each player receives one alternate art prize card: "Director Krennic". Second Place: Receives one double-sided plastic card with a "2nd" foil stamp on it: "Cavern Angels Zealot". Champion: Bye for a Regional Championship card, and one double-sided plastic card with a "1st" foil stamp on it: "Cavern Angels Zealot".